I’ve loved baseball ever since I was a kid and my father signed me up for T-ball. Even now, I always want to go to games, but Major League Baseball is so expensive — or the games sell out so quickly I don’t get to go. But here’s the thing: MLB isn’t the only baseball around. Minor League Baseball is also an option. There are 159 minor league teams in the U.S. and one team in Vancouver, British Columbia; compare that to just 30 major league teams in the U.S. and Canada. That means minor league games are much more accessible. You’ll also get better views of the game, a more family-friendly environment and more. If you love baseball and you haven’t checked out a minor league game, you’re missing out. Here are six reasons you should check out MiLB. Ticket prices are much lower at MiLB games — understandably so. While you won’t see big stars like Bryce Harper, Mike Trout and José Altuve, the up-and-coming stars of the future will be there. Seeing these young, hungry MiLB players up close for the same price as the nosebleed seats at an MLB stadium is a rewarding experience. “The average cost for a family of four to enjoy a Minor League Baseball game this season is only $64.97, a price that includes parking, two adult tickets, two child tickets, four hot dogs, two sodas and two beers,” said Jeff Lantz, senior director of communications for MiLB. By comparison, the average cost for a family of four to attend an MLB game in 2014 and pay for parking and a similar amount of refreshments was $212.46. This means your family can go to three MiLB games for the cost of one MLB game and still have cash to spare. I don’t just love baseball. I love food, too. While the classic hot dog and beer meal will run you about the same at any ballpark, even at minor league games, MiLB stadiums do have some of the most unique food items on their menus. How about a pulled pork parfait? It sounds gross, but many teams offer this combination of mashed potatoes and pulled pork layered in a cup to resemble the sweet dessert for about $7. The best part is that’s not the only creative item MiLB stadiums offer. MiLB even has a Food Fight contest that showcases the best eats at its parks. Entries in the 2016 contest included the Biloxi Shuckers’ Overstuffed Big Shrimper Po-Boy; the Charlotte Knights’ Chicken and Waffle Cone; the Connecticut Tigers’ The Bully, which looks like a cheesesteak with ribeye steak and all the fixings; and the Fresno Grizzlies’ The Urban Legends, which is a pulled-pork sandwich covered in Coca-Cola BBQ sauce topped with Pop Rocks. I must admit my diet is yelling at me for succumbing to the Sacramento River Cats’ Donut Bacon Cheeseburger. One of the cool things about MiLB is how many interesting ballparks there are. You could enjoy a view of the mountains past the outfield wall of Smith’s Ballpark; walk to historic Coney Island after a Brooklyn Cyclones game; see the trains coast past the Riverwalk Stadium outfield while enjoying the Montgomery Biscuits; or take a ferry to a 63-acre island to watch a Harrisburg Senators baseball game. Like fireworks? Many teams, like the Staten Island Yankees and the Lakewood Blueclaws, operate weekly postgame fireworks. The Blueclaws, based in Lakewood Township, New Jersey, have held its Fireworks Fridays events for many years and has seen increased attendance thanks to them. “That’s always a lock for a pretty good-sized crowd. Everybody loves fireworks and baseball,” Lantz said. There are many other events besides fireworks. The Fresno Grizzlies, for example, hold a farmers market at every Friday home game, and the San Antonio Missions offer a couple of interesting deals, including dollar nights, when you can get beer, soda and hot dogs for just $1 each. It’s easy to find out what promotions your local team is running. Each team has a “Tickets & Promotions” section on its website that lists full details of regular and special events. As a kid, getting an autograph was the biggest deal for me, whether I was at an MLB or MiLB game. Not surprisingly, MiLB players were typically more willing to sign autographs. Considering only about 10% of MiLB players make it to the majors, you’re probably not going to get a future Hall of Famer’s autograph while he’s playing Single-A ball — but all a 7-year-old cares about is that he’s a professional baseball player. That was cool enough for me. Some MiLB teams also organize appearances by better-known players and famous figures, including major league stars who are local celebrities, or those who may be training to come back from an injury. Even kids who love baseball may find it difficult to sit around for the whole game, especially during the breaks between innings. That’s why many MiLB stadiums have a kids center, where the youngest members of your family can take a break from the action without forcing you to leave the game early. Each kids center varies, so check with your local team to find out if it has a place your little one will love. Many charge a one-time fee for discounted or free tickets to games and other benefits. 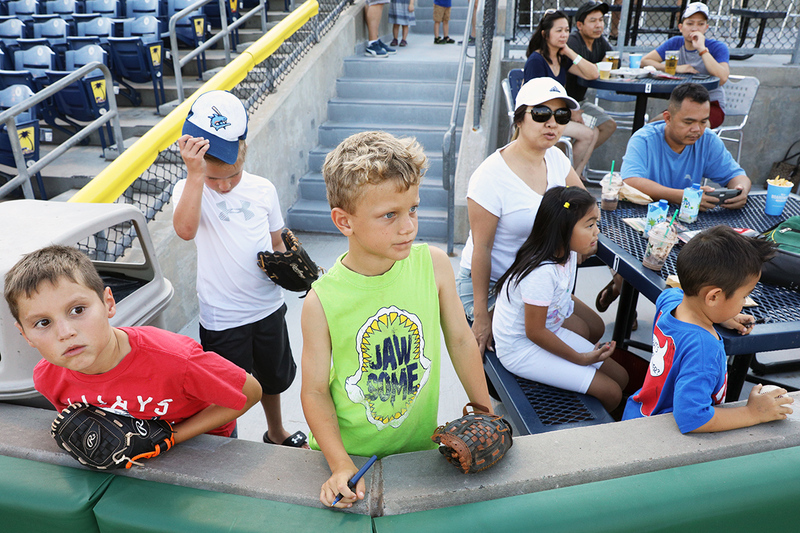 One example is the Clearwater Threshers’ Lil’ Anglers, which offers children free tickets, deals on food, and time on the field to play catch with their parents before the game. As a kid, I would’ve sold a body part for an on-field, pregame catch session! There are also many activities during the game that will keep the kiddos engaged. So, if you like baseball and want to get to some games this summer, consider checking out an MiLB game. Now go catch some foul balls! Matt Vandenburgh is an editorial intern at The Penny Hoarder and is still looking to catch his first foul ball.